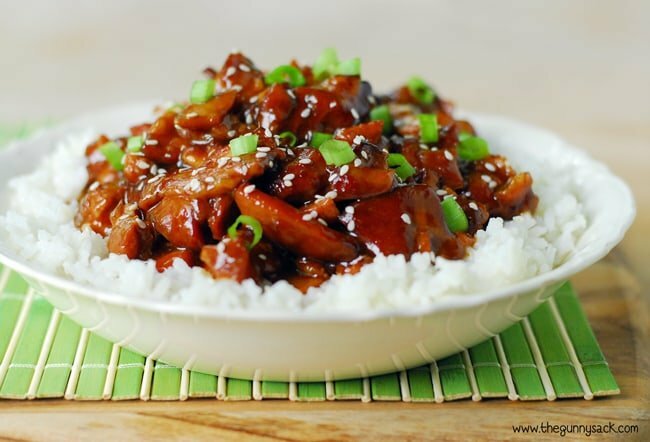 Slow Cooker Honey Sesame Chicken is a Crock Pot recipe that’s easy to make, cheaper than takeout and tastes better too! It’s a family-friendly recipe that will become a favorite. 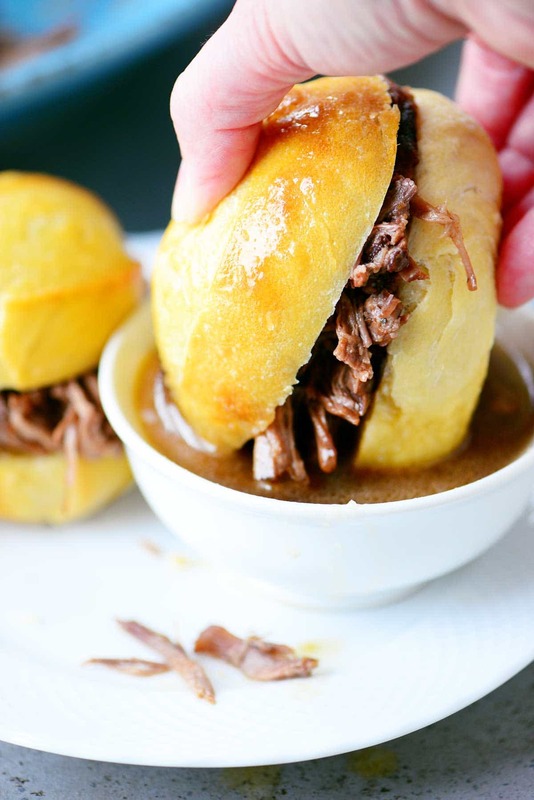 For some reason, when I think about using my Crock Pot, I think about it in the cold months filled with soups, stews and pot roast. 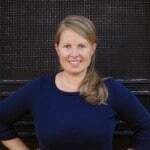 But I’ve come to realize that using a slow cooker in the summer makes a lot of sense! First of all, I don’t have to turn my oven on and heat up the house. On a day like today, when the high was 90 degrees and the humidity was 75, the air conditioner is working hard enough. I could always go fire up the grill, but I really am enjoying the cool air inside the house. Another great reason is that summer is such a busy time. I spend my days running errands, bringing my kids here and there, meeting friends at the park and trying to prepare blog posts in between. So, I love it when I remember to put dinner in the Crock Pot and voila…it is ready when we want to eat! 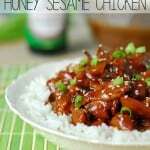 Last week, I made honey sesame chicken in my slow cooker and loved it. 1. Choose chicken thighs over chicken breasts for this recipe. I’ve tried it with both but the chicken thighs are dark meat and have more fat. This will help keep the chicken moist if that has been an issue for you. 2. Get to know your slow cooker. Every brand and every price point varies significantly. Check the chicken after two hours to see if it is done. 3. If the sauce isn’t thick enough, continue adding water and cornstarch in a 1:1 ratio (for example, dissolving 1 tbsp of cornstarch in 1 tbsp cold water) until it is as thick as you want it. 4. If your sauce is too thick, thin it out with a tablespoon of hot water at a time until it is as thin as you want. 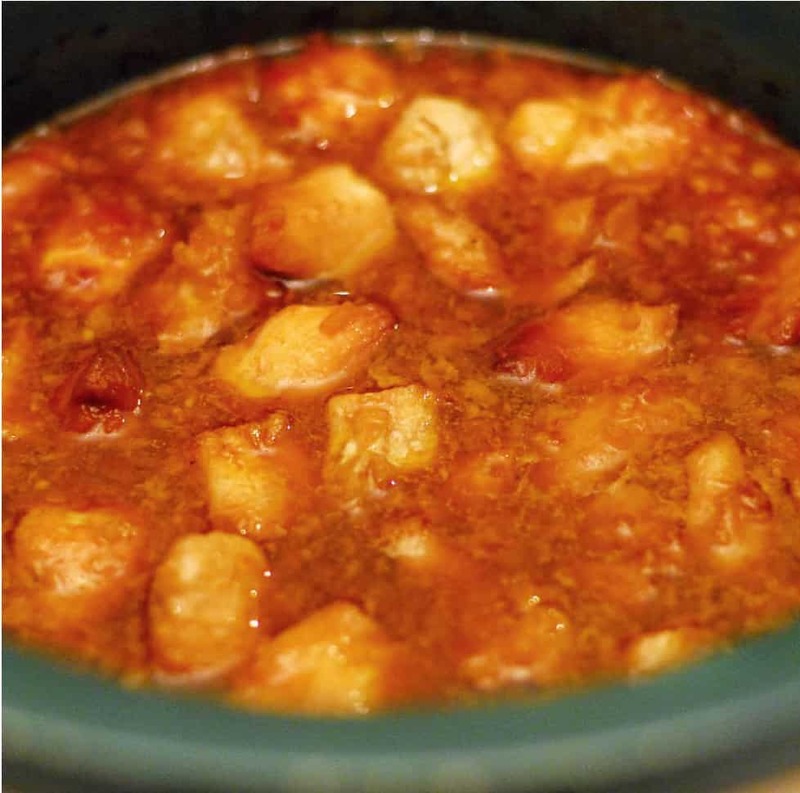 Cut the chicken into 1 to 1 1/2 inch cubes and place in a slow cooker. Make cleanup easier by using a slow cooker liner. 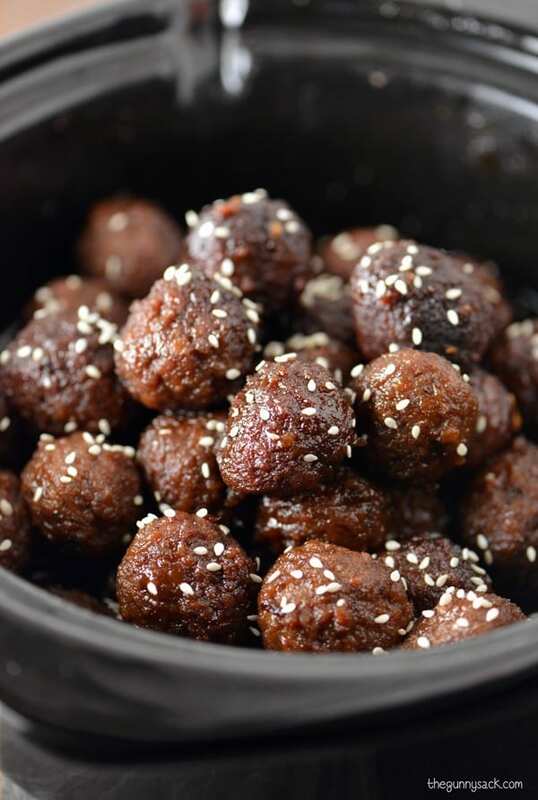 Mix together honey, low-sodium soy sauce, sesame oil, olive oil, garlic, onion, barbecue sauce and crushed red peppers in a small bowl. Pour the sauce mixture over the chicken and stir to coat. Cook on low for 2 to 4 hours or until the chicken is fully cooked. Remove the chicken from the crockpot while reserving the sauce. Pour the sauce into a saucepan. Mix together cold water and cornstarch and stir into the sauce. Cook sauce over medium heat, stirring constantly until thickened. This only takes a couple of minutes. 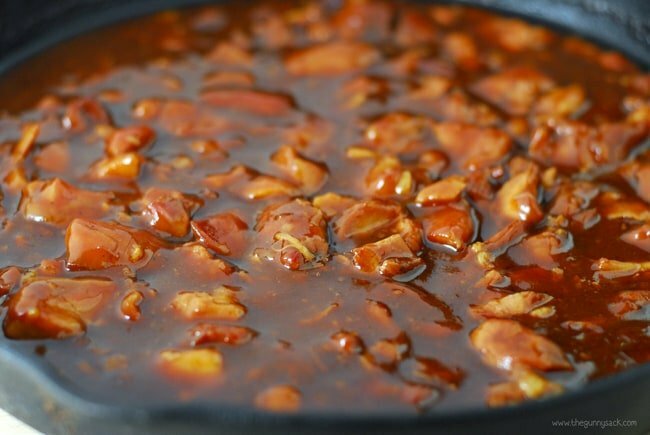 Turn the heat down to low, add chicken to sauce and break any large pieces into smaller chunks. Stir to coat while simmering. Remove from heat and sauce will thicken more as it cools. Serve over rice. Sprinkle with sesame seeds and green onions. 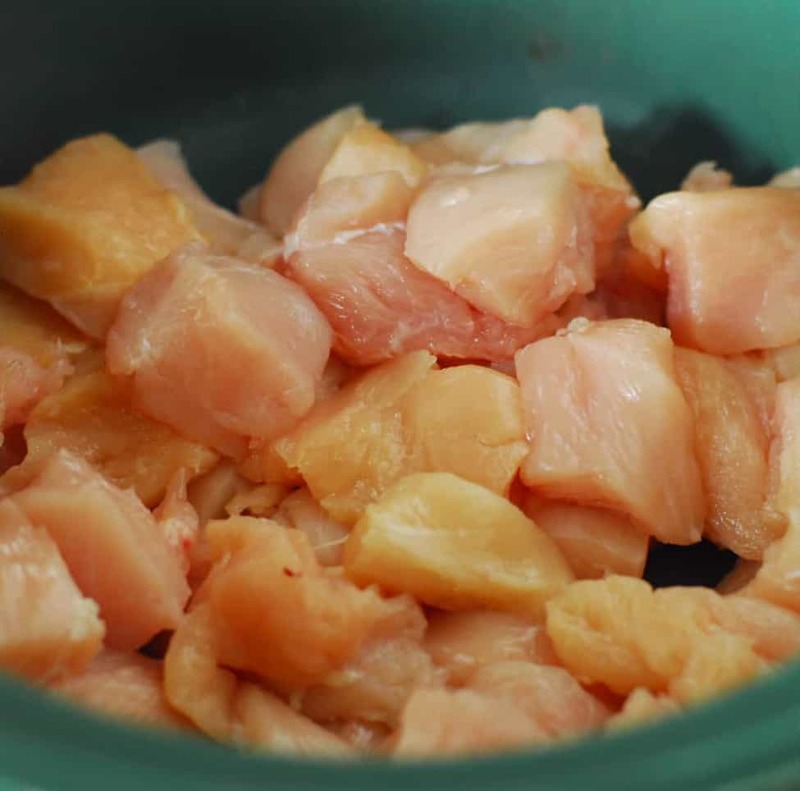 Cut chicken into 1 to 1 1/2 inch cubes and put into a crockpot. 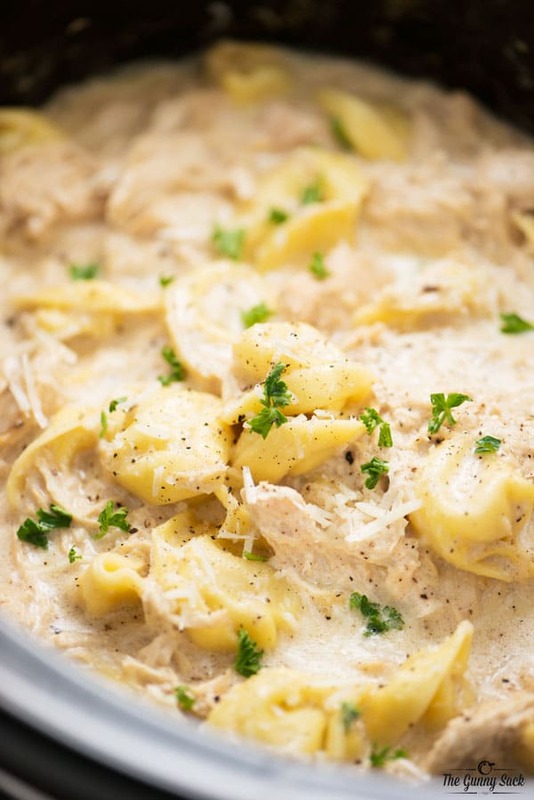 Cook on low for 2 to 4 hours, depending on your slow cooker, or until cooked. 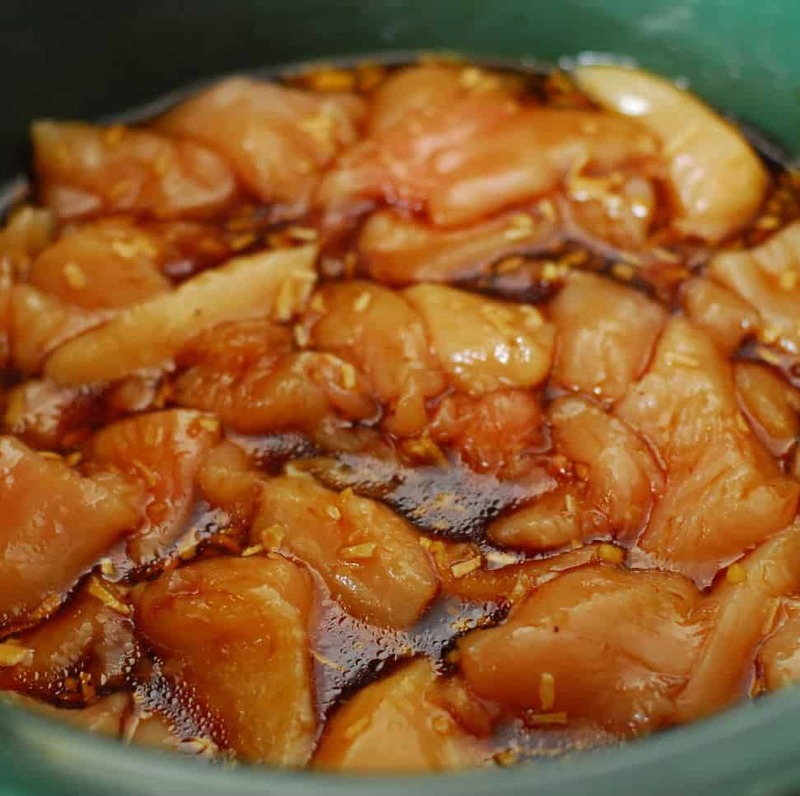 Remove the chicken from the crockpot while reserving the sauce. Pour the sauce into a saucepan over medium heat. Mix together the cold water and cornstarch and stir into the sauce. Cook sauce over medium heat, stirring constantly until thickened. This only takes a couple of minutes. Turn the heat down to low, add chicken to sauce and break any large pieces into smaller chunks. Stir to coat while simmering. Remove from heat and sauce will thicken more as it cools. Serve over rice. Sprinkle with sesame seeds and sliced green onions. 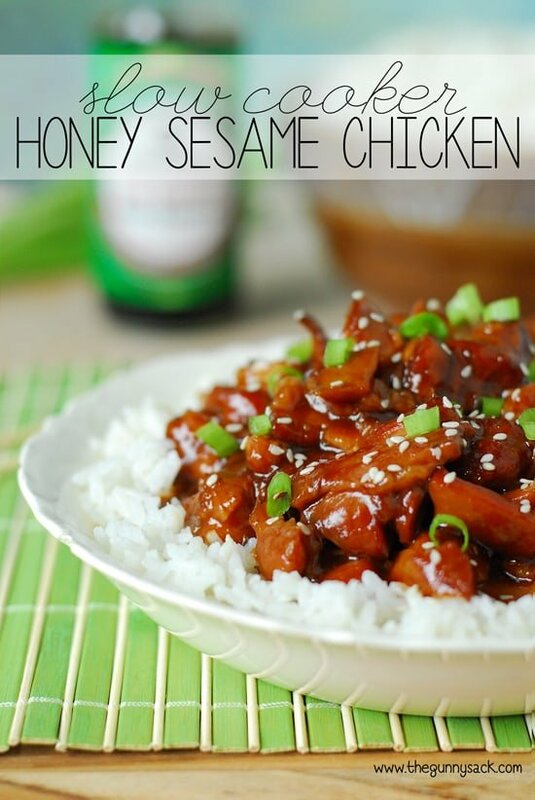 Click here to save this slow cooker honey sesame chicken recipe to your Pinterest boards. Follow The Gunny Sack’s board Dinner on Pinterest. I know this recipe has been on Pinterest for a while but I tried it today and it was a recipe fail for me. Is it normal for a crock pot to have a setting for 2 hours on low? Would 2 hours on low actually completely cook the chicken? Maybe I read that wrong. Tried to cook mine on the shortest low setting… Turned out over cooked and extremely dry. It’s looks like people have had a lot of luck with this recipe. I’m a little surprised by that. Didn’t really care for the flavor. Ingredients were not cheap and it was kind of a lot of work for a crockpot recipe. This recipe grabbed me, because I wanted to make something really easy tonight. I was feeling super lazy. I threw the boneless, skinless chicken into the pot frozen. Since I live alone, I used about a pound of chicken and half the sauce. I recently purchased a rice cooker at Costco, and it has a slow cooker feature. I cooked the chicken on high for 2 hours, and it was definitely done. I removed the chicken and cut it up. While I was doing that, I put 4 cups of carrots and broccoli and half an onion in the pot (in the sauce) on high. The veggies were done after about 20 minutes. How easy does it get? I stirred everything together and served it over rice. This was an acceptable meal, but it is missing something. I have a similar recipe that I make with chicken wing drumettes, and it is cooked on the stove top. The other recipe is much better for some reason. It is called Asian Glazed Drumsticks. I think that recipe is better, because the chicken is cooked on the bone. I think bone marrow helps to thicken the sauce. Still, if I was feeling lazy again some day, and if I had everything on hand to make this, I would make it again.